Best of 2013 Poll for NYC Emerging Artists: FINAL RESULTS! Our Year End Poll for Emerging NYC Artists was - as usual - a painstaking (and somewhat excruciating) process, but we pulled it off with remarkable flair! Kudos to punk rock hell raisers BIG UPS (pictured and streaming) for winning the poll and - with it - the cover of our Spring 2014 issue! Thumbs up to wicked avant-indie trio Celestial Shore (already featured on our mag's cover last summer), and to quirky electro-soul-pop band Wet, our record of the month back in October. Here is how it all went down: first, we let the local bands submit their music (for free), and got our Deli editors to pick the nominees. 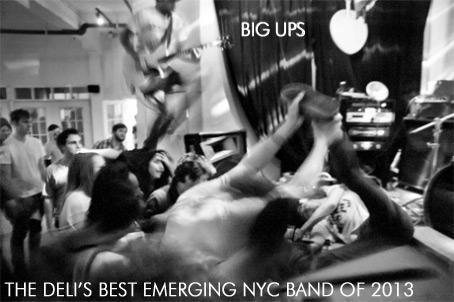 Then we polled a list of 15+ NYC scene expert (our jury) and asked them to nominate 3 more bands of their choice each. Then we polled our writers, then we polled our readers. We tried to keep things open for each single genre, from Indie Rock to Roots Music to Hip Hop. Jurors List: Alex Rossiter (Webster Hall), Alice Grandoit, (Red Bull Sound Select), Andy Bodor (Cake Shop), Ben Krieger (Sidewalk Cafe), Billy Jones (Baby's All Right), Bowery Electric Booking peeps, Samantha Cox (BMI), Derek Evers (Impose Mag), Eric Berrebbi (Arlene's Booking), Eric Weiner (The Wild Honey Pie), Heath Miller (Excess dB Entertainment), Jacob Moyers (Cameo), Lauren Beck (The L Mag), Lucas Sacks (Brooklyn Bowl), Matt McDonald (CMJ), Matt Ushkow (Bowery Presents), Max Brennan (Lit), Paolo De Gregorio (The Deli), Patrick McNamara (OhMyRockness), Rami Haykal (Pop Gun Presents), Richard Sloven (Knitting Factory), Steve Trimboli (Goodbye Blue Monday), Steven King (The Rock Shop), Steven Matrick (Pianos), The Delancey's Booking peeps, Todd Abramson (Union Hall), Zack Dinerstein (Spike Hill).